Join us for an exciting, fun, and informative clinic with veteran Major League Umpire Jim Evans! 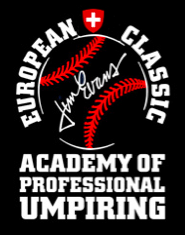 This umpire training clinic will be undertaken by Jim Evans, one of the world’s best umpire trainers along with pro school instructors and local assistant instructors. The course includes a total of more than 40 hours of intense tuition in umpiring. Jim Evans umpired professionally at the Major League level for 28 years. During that time, he worked over 3900 MLB games including 4 World Series, 9 Championship Playoffs, and 3 All-Star contests. He served as a Major League crew chief for 19 years. In addition to his vast professional umpiring accomplishments, Jim graduated from the University of Texas with a Bachelor of Science degree in Education. In 1990, he founded the Jim Evans Academy of Professional Umpiring and trained many of the umpires in the Major Leagues today. He has trained thousands of amateur umpires throughout the United States, Japan, and Europe and has produced books, training manuals, and DVDs to educate umpires. Recognized internationally for his teaching accomplishments, Jim has conducted training throughout Japan, France, the Czech Republic, Switzerland, and Austria. The Madrid Clinic will represent the 5th program Jim and his staff have conducted in Europe. He has conducted 21 clinics in Japan. Jim Evans training is the most comprehensive in the world today. The European Clinics (JEEC) are exact replicas of the famous 5-day clinics Jim conducts in the US. The curriculum is very thorough and covers a vast array of topics including the following: positioning theory in the two-umpire system; communication and terminology; the 7 Laws of Umpiring; professional principles; angle/distance theory; timing techniques; reading cues; footwork; making adjustments; proper dress and use of equipment; intensive study of the Official Baseball Rules; checked swings; pitching regulations and balks; plate mechanics; plays at the plate; developing a strike zone; and game management. Jim is a hands-on trainer who will be working personally with his students each day in the classroom and on-the-field. He will be assisted by a former Academy instructor and other umpires who have completed his 5-week professional course. The training day begins in the classroom where rules and responsibilities in the two- and 3-umpire system are thoroughly explained. Classroom exercises, discussion, and video enhance the students’ learning experience. Following lunch, the training shifts outdoors where the material covered in the classroom is reinforced with demonstrations and drills. An emphasis is placed on establishing a solid plate stance, proper mechanics, and a consistent strike zone. Umpires from all levels of experience are welcome and sure to benefit from Jim’s unique curriculum and training techniques. Students are rewarded with a fun-filled graduation dinner following the last training session. JEEC graduates will return home with a new understanding of the umpire’s job and the skills to strengthen their confidence. Students who complete the JEEC will receive a graduation certificate to document their training. Travel to and from your home to the event is not included. This event is totally self-funded and will be limited to a maximum of approx. 40 students on a first come, first served basis. Students should have a reasonable level of fitness as you will be on your feet at least 4 hours in the afternoon (often running). There is no pre-requisite level of umpiring required for this course as everyone will be treated equally; all umpires welcome!